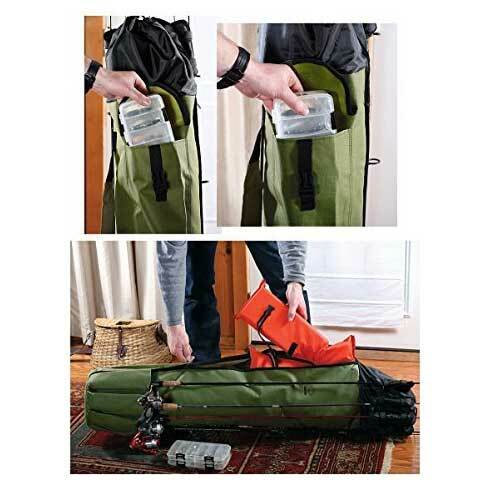 Having a fishing rod storage bag with a strap makes getting ready for a trip a breeze. This one here has a large exterior pocket, a padded adjustable shoulder strap, and 5 fishing rod slots. It also makes it so rods are just laying around, which often leads to them being stepped on and tips breaking. This fishing rod carrying gift neatly and safely stores fishing poles and allows the owner to easily take all their poles with them. It’s convenient taking all the poles on and off the boat without having to worry about the tips getting broken. This is a great accessory for fishermen with a lot of fishing poles that often travel to fishing spots. It’s also a great tool to store all your fishing poles and supplies and keep them ready for the next trip.